Is it time to review the way exams are taken? It is exam time in schools around the UK. My son, aged 14, has SATs all week, while my daughter has GCSE papers from next Tuesday onwards. Some of her friends are locked in the art room for their practical exam today and tomorrow, others still have sore thumbs from last week's textiles practical. For the art exam, students can take in material they have prepared in advance, like sketches and ideas, but in general anything that might be considered to give an unfair advantage is forbidden. According to Chailey School in Sussex, this includes "calculator cases/ instruction leaflets, bags, personal TV/stereos, electronic or radio communication devices, including mobile telephones". Bringing these in counts as cheating, and if your mobile is turned on you will fail the whole course, not just one paper. This seems reasonable to those who have been through the exam system, but in fact the idea that you can assess someone's knowledge and ability by getting them to sit isolated in a room for three hours regurgitating facts or writing essays from scratch is a peculiar invention of the modern age. 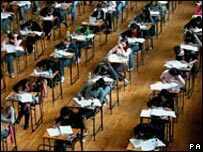 The history of exams was recently explored on BBC Radio 4 in 'Turn over your papers...now! ', an entertaining and witty look at the way written papers, essays and multiple choice tests replaced other forms of assessment. Presented by writer John O'Farrell, it reinforced my view that the way we currently do things has more to do with satisfying the needs of university admission officers and the administrators of the Victorian civil service than helping people show their talents and abilities to the best. And yet the government has recently announced a move away from coursework for GCSEs because they think it makes it too easy to cheat, and because it privileges those children whose parents offer help and support. It will be back to pass or fail exams for my son as he embarks on his GCSE Maths, unlike his coursework-laden sister. And although he will be allowed a calculator, he won't be able to use any of the other computational tools that are available. He may, of course, use a computer to actually sit the exam, but that's a separate matter. Taking multiple-choice tests on a computer is a well-established practice, and though we need to consider the same issues as we do with e-voting, like providing a paper record, it can be made to work. But he will not have a chance to demonstrate his research skills, or his ability to work with others, or his understanding of the core technology that supports so much of modern life, the internet. 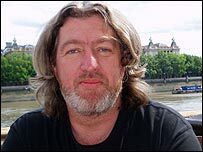 When I began working at The Guardian newspaper in 1995 there was one internet-connected PC on each floor of the building, except in the online department where I worked. This was considered sufficient for the few occasions on which journalists would want to go there for research, because the Atex terminals had access to an array of online databases. Today it would be unthinkable to restrict a reporter's access to the net. Last week my friend Anne had some work done in her front garden, and the gardeners cut through her network cable. This was bad enough for her as a freelance writer, but her daughter - currently taking GCSE art - was distraught and could not be pacified, locked out of the sources she needed to prepare for the crucial practical. In the end, Ric, our local IT support expert, came through and patched the cable, but it was a close run thing. And it highlighted for me the way that the exam system fails to acknowledge this important aspect of our children's education. Giving grades for IT as a core skill is not nearly enough; we need to let them show what they can really do online. Yet school exams do nothing to assess ability in a world where access to computers, the internet and the tools they offer are so embedded in daily life that not being online is unimaginable. I don't think we should completely replace essay questions and three-hour exams. There will always be a need to test knowledge, to try to find out what someone actually knows. But there is an increasing need to find out how someone researches, how they use available resources and how they manage to filter, synthesise and edit the information available to them. Open book exams are already used around the world, letting students use specific reference materials as research aids. Perhaps it's time we considered open laptop exams too, at least for some papers.